My guild (Gainesville Modern Quilters) has a chance to exhibit our modern quilts at a local college, and I want to make something a little outside of my usual style. I’ve been playing around with a palette of teal and salmon, but hadn’t quite hit upon a design that was interesting but still simple enough. 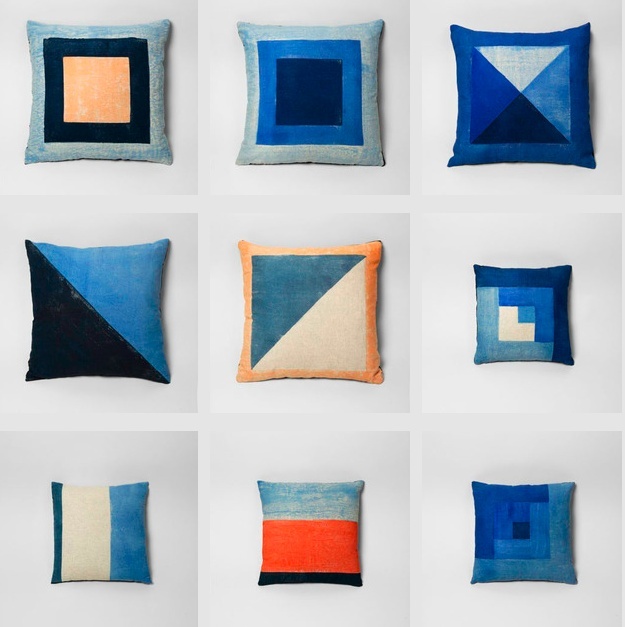 Then, I was browsing around pinterest (I could go on about why I love pinterest, but I’ll save that for another time) and I came across this photo of pillows from London textile designer Naomi Paul. All those lovely blues and touches of peach — I found the perfect design. I love the limited palette and the traditional quilt motifs. I’m planning to make nine blocks with blues, bone, salmon and coral (of course!) with Kona snow between. I’m hoping to finish the quilt top this weekend! This entry was posted in inspiration, Modern Quilt Guild, quilts and tagged modern quilt design, modern quilt exhibit, naomi paul, pinterest on October 3, 2013 by brigitdermott.